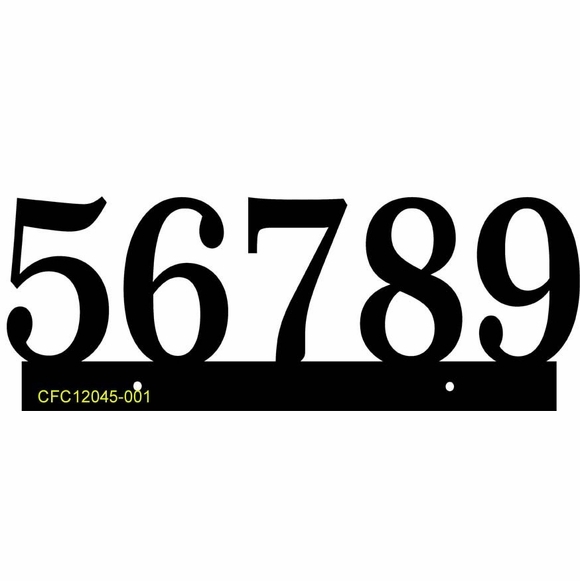 Personalized Address Plaque with Floating Numbers - - a Comfort House exclusive custom made for you. Choose color: burgundy, ivory, white, grey, charcoal, red, yellow, green, blue, and brown as well as black. Custom made in the USA. Cut-out, silhouette characters (letters or numbers per your customization) seem to float in the air. The characters with their individual profiles are attached to the narrow border (approximately 1" high) at the bottom. This is a one-piece, one-line sign. Manufactured with modified, non rusting acrylic plastic. Wall mount or lawn mount with our optional lawn stake. Attach to the optional Comfort House Lawn Stake. When mounted on a wall, the wall is the background. When attached to the lawn stake, the characters will indeed appear to float. Approximate dimensions: 12"W x 4-1/2"H x 1/8". Final width will depend on number of characters. Supplied with 3/16� mounting holes and stainless steel screws. ** Our floating character plaque can also be manufactured in a size up to 36" wide and/or with a larger character size. See example above of 19486 sign made with 6" characters. Please use the Request a Custom Quote link at the top of this page to receive a quotation for your specific requirements.